School of Medicine (Department of Paediatrics), Royal College of Surgeons in Ireland, Dublin, Ireland. 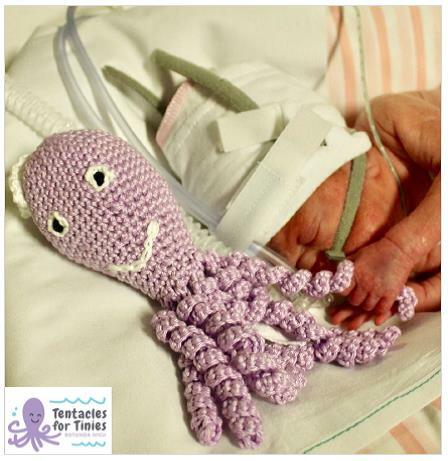 The use of crocheted octopus in neonatal units first began with the ‘Octo Project’ in Denmark in 2013 and has since spread internationally1. The tentacles of the crocheted octopus are designed to resemble the umbilical cord. Anecdotal reports suggest when premature babies hold the tentacles of the octoupus they were calmer, less likely interfer with monitoring equipment and appear more comfortable overall, possibly as they were reminded of their time in the womb. However, to date,there is no published evidence on the potential benefits of octopus. The Rotunda Hospital launched ‘The Tentacles for Tinies’ pilot project in November 2017 (Figure 1). The purpose was to evaluate the potential benefits of octopus, monitor changes in heart rate and respiratory status and assess parental impressions. Multidisciplinary input was sought from nursing staff, neonatologists, microbiology physicians and infection control officers to create appropriate protocols for the safety and practical aspects of the project; including a washing schedule. Babies born less than 34 weeks gestation from 14 days old or when out of humidity were eligible for inclusion. All parents of eligible infants were approached and consented to participate on an opt-in basis. We performed a small observation study of 28 babies to assess the impact of octopus on babies’ heart rate, oxygen saturations and number of desaturation events. Those were recorded for a 15 minute epoch while the baby was holding an octopus and compared with a subsequent 15 minute epoch while the baby was not holding an octopus. There were no differences in median heart rate measurements, 161bpm [150-164] vs 162bpm [153-166] (p = 0.117), and median oxygen saturation measurements, 97% [94-99] vs 96% [93-98] (p = 0.634), between the two epochs. Babies had less desaturations while holding octopus with a median of 1 [0-4] desaturation versus 3 [0-7] desaturations while not holding an octopus, however this did not reach statistical significance (p=0.162). Parental impressions of the project were overwhelmingly positive as assessed by a postal survey. 100% of parents surveyed reported that they liked the project. All parents surveyed felt that the programme was beneficial to their babies and 100% reported that the programme helped improve their involvement in their babies care. We have been very fortunate to receive phenomenal support from numerous volunteer community, charity and university groups across Ireland who have dedicated their time to crocheting octopus. Many such volunteers have themselves experienced premature birth and report how much they enjoyed participating in this programme. In conclusion, larger studies are needed to fully assess the safety and efficacy of octopus. However, the results of this pilot study are encouraging. The pilot has been warmly received by staff and the wider community who are committed to supporting this altruistic project. Most importantly, parents feel that octopus increase their involvement in the care of their baby and are very beneficial to their babies during their journey through the neonatal unit. 1. The Danish Octo Project [Available from: https://www.spruttegruppen.dk/danish-octo-project-english/.